Eljean Madio joined the staff this year. She lived in Hawaii before coming to Oregon. 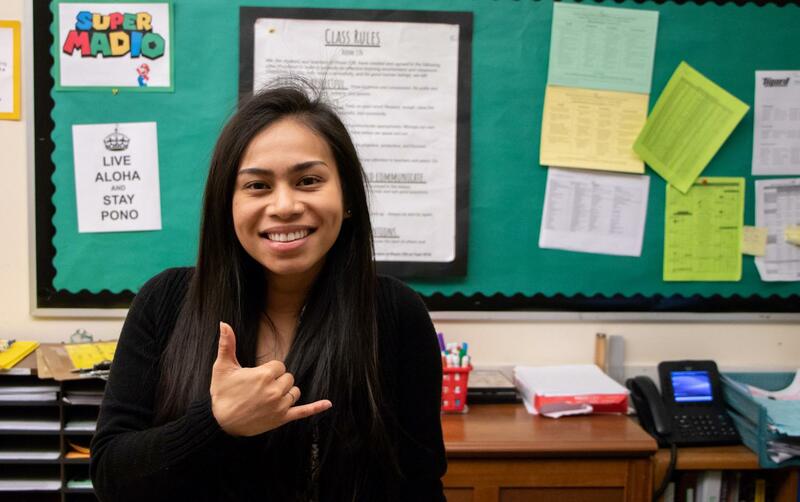 From Hawaii, to Oregon, new teacher Eljean Madio is excited for her journey at Tigard High School. This year Tigard High School welcomed many new teachers, including Eljean Madio. Madio is a sophomore English teacher teaching the new elective, Race in the 21st Century. Madio grew up in Hawaii. Home of beautiful beaches, exquisite food, and a variety of attractions, and activities. Many people love going there for vacation, but Madio got to call this piece of paradise her home. Madio grew up in Honolulu, the capital of Oahu. There she loved to eat the delicious dishes of Hawaii and enjoy the beautiful landscapes. Whether it was biking across the island, or enjoying here favorite dish, poke, she was always doing something exciting. She attended Hawaii Pacific University, where she received her Bachelor’s in History, and her Masters of Education. She became very passionate for history at a young age, and always loved reading books. So, it was very natural for her to teach those two things. At the start of her teaching career she taught at Waipahu High School. Now she teaches at Tigard High School where she is able to combine her passions of history and reading into the classes she teaches. Madio is a very caring teacher who always make sure her students are getting the help they need. One quote she lives by is “be the person you needed when you were young.” For her, this means to be a good person every day, and to always embody your best self. She even inspires all of her students to do the same thing. She believes that, no matter what, if you are a good person, you will always succeed in life. Moving from Hawaii, to Oregon was a big change for Madio. She visited for the first time last year, and instantly fell in love with the area. “There are so many things to do here, and I never get bored,” Madio said. One of the reasons she moved here, was because she loved the array of activities to do, such as hiking, going to the beach, camping, and visiting landmarks. So far, Madio has loved living in Oregon. (However, she has never been here during the winter.) Besides that, her favorite part about Oregon is teaching at Tigard High School. She loves all of the fun and exciting energy her students have, and that each one of them cares about their education. Everyday Madio tries to make her teaching plan fun and interesting to make her students engaged about what they are learning about. Whether its a slideshow, a part of a Disney movie, or an occasional meme or two, students are never bored in her class. One of the nicknames students call her is Super Madio. Since her name is one letter off of the famous video game character, Super Mario, she has adapted that name over the years. Super Madio coming to a classroom near you, ready to do battle for to help her students learn.